This will be an unusual post. 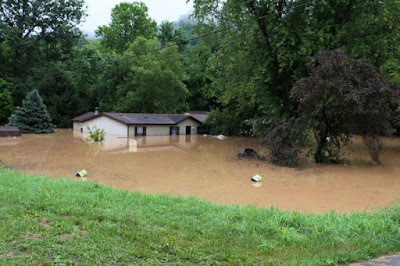 You might have been following the story about the flooding in West Virginia. In my house, it's very personal, since it's very nearly my wife's hometown. We were just there the week before the flood happened. I just spoke in their church, Elkview Baptist, which is now flooded. So is the high school where she went to school. Thankfully, my inlaws live on the top of a mountain there, but it's still been hard watching my wife struggle with the pictures and stories on Facebook. Her childhood best friend Autumn lost everything. Literally everything. What is Homo naledi, anyway? 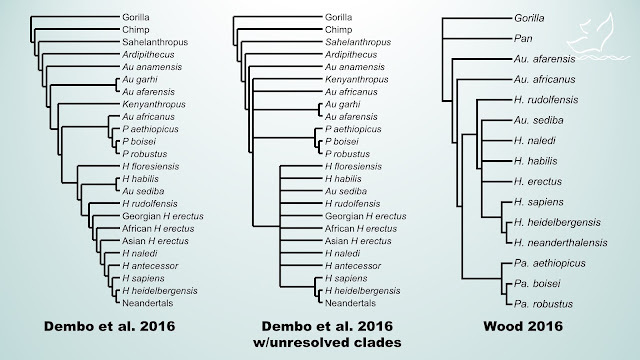 There's a new study on the phylogeny of Homo naledi published today in the August issue of Journal of Human Evolution (it's a preprint). The study is written by Mana Dembo and colleagues. They compiled a massive matrix of 391 characters (a supermatrix), all from the skull and teeth. They scored these characters on 22 different hominins and chimps and gorillas. For H. naledi, they compiled only 123 of those characters from the original bones at Wits (Dembo was on the H. naledi research team). That's considerably more than the 87 published in the supplemental material of Berger's original description of H. naledi, which I used previously to do my own phylogenetic analysis. Core Academy supports student internships and needs your help! There's a challenge gift of $650 to support this work, but we need your support to claim it. Read all about it here, and remember that contributions to Core Academy are tax deductible. And don't forget about Pies & Prayers!